I’ve long been interested in the social lives of animals, and for the last few years I’ve focused in particular on how animals obtain information from each other and how this social information affects their behaviour. Much of this work has used small fishes of various species, including sticklebacks. Researchers have shown that many shoaling fishes are adept social learners, well attuned to the behaviour of other members of their groups. For example, they are readily attracted to areas where they can see others that are feeding, even if they cannot detect the food itself. Experienced fish are often followed by others and they can lead the shoal, passively and without any form of communication occurring, to particular locations where they have been trained to expect food. Many of the experiments that my collaborators and I have performed have entailed presenting a single focal fish with different types of cues and then looking at the decisions that it goes on to make. On the one hand this approach makes good sense- by concentrating our attention on a single individual we can be reasonably confident that its behaviour reflects its responses to the experimental conditions to which we have subjected it. We can get a good handle on the mechanisms by which it has acquired information because this approach allows us to understand what and how it has learned, and who it learned it from. On the other hand, studying the socially-influenced behaviours of group-living animals in isolation is a bit unnatural. In the real world such animals must make decisions within a social setting and their behaviour will be influenced not only by what they have learned in past but also by the social cues that they continue to receive at any given moment from the other animals around them. With this in mind we have also run projects investigating the ways in which animals acquire and are influenced by social information while in groups, using approaches that try to combine elements of a controlled experimental environment with some of the noisy complexity of the natural world. 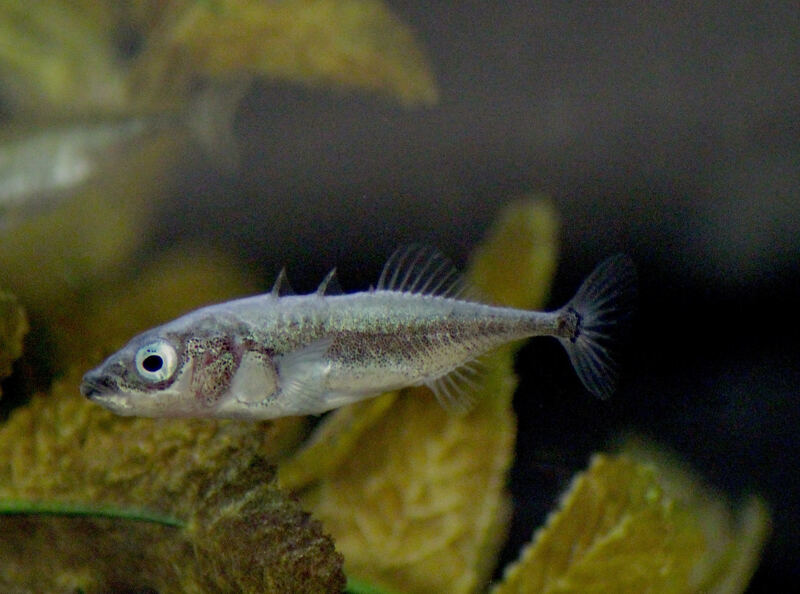 A threespine stickleback (Gasterosteus aculeatus), the species we used in this research project (photograph credit: Helen Spence-Jones). At the time that I began to think about this project I was involved in a series of studies looking at how social networks could be used to measure the rate and spread of information through shoals of foraging fish. One finding from this work was that the tendency of fish to follow each other was important in determining how they found hidden food patches. Often, fish that had already found them would subsequently return and be accompanied by others, who then discovered the food too . At around the same time I read about some interesting work that showed that pairs of homing pigeons sometimes exchanged leader-follower roles along sections of their preferred route back to their loft . Thinking about this work and our findings with the fish, it struck me that a seemingly simple social process- leadership of naïve fish by their experienced group mates- might conceivably give rise to more complicated interactions, whereby animals with partial but complementary information might exchange leadership roles, potentially allowing them to integrate their experience and solve problems collectively. Talking with Kevin Laland, my post-doctoral supervisor at the time, we began to think about how to test these ideas. We decided upon an experiment in which groups of fish had to overcome two tasks in order to access some food. First they had to find it and then they had to reach it. Here, some fish could be trained to the first task, some to the second and some to neither. No one fish would be trained to both tasks. After some playing around with ideas we settled upon a design in which the location of the food patch would be indicated by a green light. Sticklebacks can readily be trained to approach a light if it is paired with food and the training was relatively straight forward. The second task was a bit trickier to nail down and it took some trial and error to get things working. We put the food in a mesh box and trained the fish to swim through a hole in the side to get to it. Initially the fish could not figure this out at all and we ended up having to ‘scaffold’ the training process, starting with completely open sides and gradually making the openings smaller once they had got the hang of entering the box to feed. Once these tasks were designed and validated with pilot work, the experiments themselves were pretty simple to run. Unfortunately, after completing the experiments I ended up doing nothing with the data for about four years. In what is probably a familiar story to many, with the end of my postdoc looming I spent the best part of a fruitless year applying for fellowships and jobs, to the utter detriment of my research output. Eventually I was fortunate enough to secure a lectureship in St Andrews and while this was great for me it meant that the project again went on extended hiatus again as I immersed myself in preparing course materials. In 2016 I once more had the time to revisit the project. By this point Andrew Whalen had joined Kevin’s research group as a PhD student, exploring computational and statistical analyses of social learning. Working together we were finally able to turn the data set into a paper. Our analyses revealed that, as we predicted, the fish shoals did exhibit a form of experience pooling. In shoals comprising fish trained in each of the tasks, more fish accessed the food, and did so more rapidly, compared with other shoal compositions. Having experienced individuals in the shoal made a big difference to group performance and increased the likelihood of untrained fish completing each stage, with the following of trained fish by their untrained group mates being the likely mechanism behind this effect. Why does any of this matter? There is currently a great deal of interest from research groups into how animal groups process information, in no small part because of its potential applications for AI and swarm robotics. Some researchers have argued that several different mechanisms, from swarm intelligence to facilitation to pool-of-competence effects might be at play, and that for some taxa at least more work is needed to identify the means by which animals collectively solve problems . Our project demonstrates that pool-of-competence effects are a plausible means by which animal groups might overcome challenges, and reveals the processes by which this can occur. Looking ahead, we hope to extend this work by figuring out just how the experienced fish are able to recruit their naïve group mates, by looking at whether fish make use of different and more naturally realistic cues when navigating, such as flow direction, depth gradients and physical landmarks and by investigating the strength of experience pooling effects when the numbers and ratios of experienced and naïve individuals are varied. Atton N, Hoppitt W, Webster MM, Galef BG, Laland KN. 2012. Information flow through threespine stickleback networks without social transmission. Proceedings of the Royal Society of London B: Biological Sciences, p.rspb20121462. Biro D, Sumpter DJ, Meade J, Guilford T. 2006. From compromise to leadership in pigeon homing. Current Biology, 16, 2123-2128. I’m a biologist interested in the functions and evolution of group living in animals. I investigate how groups are organised, how animals interact and acquire information from one another, and how individual behaviour affects and is affected by that of the group.